Speedy installation and reliability in operation, these are a couple of the many features found in the new AlertMAXX alarms from Delta Membrane Systems. They are used in sump installations, with the new DMS270 AlertMAXX being used for ground water and surface water applications, and the DMS269 AlertMAXX for foul water use. Just two fixings are required along with the connection of mains power and a float switch for the AlertMAXX to be fully operational. Should a power cut occur, a battery backup has been incorporated into the design to ensure constant operation. Each model has an LED display that shows the current status, high level alarm, previous cancelled alarms, mains failure and service reminder. ‘Volt free’ contacts are included as standard for connectivity to building management systems. 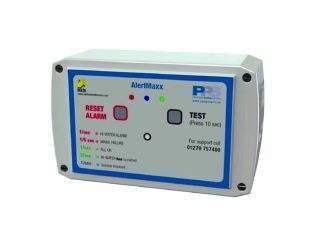 As an option, a cable can be supplied to download the internal log from AlertMAXX to either a PC or iPad showing all events that have occurred in the past. The foul water option is supplied with a robust and reliable pendant type float switch which is fixed to the pipe-work or pump, or is left free hanging using a float weight to allow correct operation. With the ground water AlertMAXX, a ‘broken finger’ float switch is fitted to give accurate operation and allow the alarm signal to be given after pump one fails, leaving pump two (where fitted) to operate normally. The design of the new alarms also prevents accidental deactivation, although the alarm can be muted. A low cost telemetry – known as MessageMAXX – can also be added.